ALINESYS.com's Sealer, Open Back (S.O.B.) 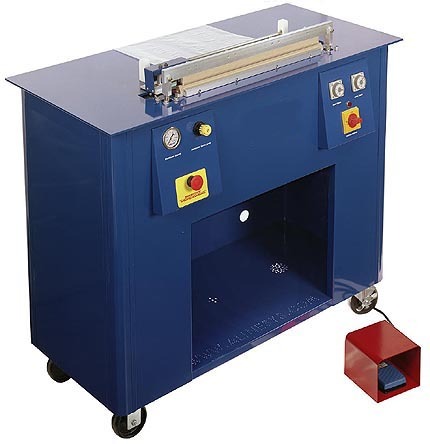 is a heavy-duty thermal impulse sealer built into a solid aluminum and steel frame. This configuration is ideal for any bag making or sealing operation. This unit is ruggedly built for continual operation and economically priced. Each sealer is pneumatically powered and available with either standard impulse controls (Heat and Cool time) or digital controls, fully validateable for medical applications. Our unique cabinet style can be used to store a water chiller or rolls of your film. Each unit is free standing on lockdown casters. Seal lengths are available in 20 or 30 inches with choice of round wires up to 1/2 inch wide seals. Every sealers is guaranteed to provide a airtight/watertight seal. We also offer a unique cylinder mounted flying knife should you require cutting behind the line of the seal. Every Aline sealer is an ideal replacement for all VERTROD STYLE machinery. All Aline units come with a one-year warranty, detailed operating instructions and a spare parts kit.